The marketing terms Gourmet / Exotic / Specialty / Medicinal Mushrooms are all synonymous. The international and local markets for these mushrooms continue to grow due to interest in their nutritional and especially health benefits. As fungi, mushrooms have life cycles very different from those of green plants and should therefore be cultivated differently. The choice of species to cultivate depends mainly on the type of growth media (substrate) available and on market considerations including microtrends. 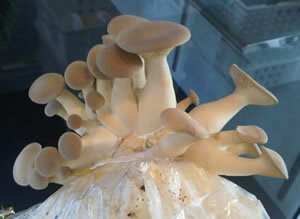 Oyster mushroom species such as the Tree Oyster (Pleurotus ostreatus), Phoenix Oyster (Pleurotus pulmonarius) and Pink Oyster (Pleurotus djamor) are easiest for the beginner. Shiitake (Lentinula edodes) already has earned considerable consumer demand in both fresh and dried form, although more challenging to cultivate when using the modern synthetic / artificial bag cultivation method. Mushroom production, carried out on an entrepreneurial, semi-commercial, commercial or industrial scale, is an efficient and relatively short process - just a few weeks - of turning low value agricultural, forestry or invasive waste into high value mushrooms, which is an excellent source of protein and beneficial micro- and macroelements. Both Shiitake and Oyster mushroom species reveal high efficiency in degradation of a wide range of lignocellulosic substrates, such as wheat straw, cotton wastes, coffee pulp, corn cobs, sunflower seed hulls, wood chips and sawdust, peanut shells, vine prunings and others into mushrooms and thus mushroom protein. Depending on the species cultivated, the protein content of mushroom fruiting bodies might range from 17 - 33 g protein / 100 g dry weight. Apart from Shiitake, other mushroom species with a three week shelf life such as the King Oyster (Pleurotus eryngii), Enoki (Flammulina velutipes), Nameko (Pholiota microspora/ nameko), white and brown Shimeji (Hypsizygus tessulatus), Giant Clitocybe (Clitocybe maxima) and Maitake (Grifola frondosa) etc. are gaining in popularity. Lion’s Mane (Hericium erinaceus) and Pioppino (Cyclocybe / Agrocybe aegerita) are also sought after for their exceptional taste and ease of cultivation, respectively. The evaluation of a mushroom enterprise should include a careful business analysis of the most suitable mushroom species, substrate formulations, climate control options (including temperature, humidity, air flow and light intensity), cultivation procedures and potential markets. The road to success is by getting the important and necessary information from the qualified professionals. Enrol for an Entrepreneurial, Semi- Commercial or Commercial Course at the Academy by either attending in Cape Town, Johannesburg, Durban, Port Elizabeth, or East London (South Africa) or globally via Distance Education by means of the popular e-Learning option. Alternatively, consider attending the Industrial Course in Berlin (Germany), Singapore, Hong Kong or Mauritius. Cape Connoisseur Champignons (Pty) Ltd trading as the South African Gourmet Mushroom Academy® is the leading mushroom training and awareness provider in the Southern Hemisphere with a presence in key markets in Africa, Europe, East & South East Asia and the Indian Ocean Islands, serving companies as well as individuals. With its modern training and marketing approach and qualified lecturers, the independent company offers a full portfolio of gourmet and other mushroom-related services, solutions and products, ranging from courses and events to distance education via e-Learning or correspondence. South African Gourmet Mushroom Academy® educates and enlightens thousands since 2005. Headquartered in Cape Town, the company focusses on aspiring and existing mushroom cultivators in Africa and beyond. When using the services of the Academy, you can rest assured that you not only gain the experience garnered from many years of cultivation, but from a strong academic and professional grounding in all aspects of the discipline. Too many service providers in the industry, even today, have blind spots, that they are unaware of, by virtue of only relying on being self-taught. Adriaan is a well-known international researcher and gourmet mushroom educator who has challenged and changed the way retail groups and customers perceive mushrooms. With perspectives that often contradict conventional mushroom cultivation methodology, he has earned a reputation for straightforward talk, poise and courage. He is regarded worldwide as a passionate advocate of empowerment via education. Well equipped with post graduate degrees in mycology, additional business and international mushroom cultivation qualifications (UK and the Netherlands), Adriaan and his team of equally qualified business and marketing professionals is changing the local and international mushroom scenario. Visits and study tours to leading mushroom research centres and private companies in the Netherlands, Germany, France, Spain, Sweden, Switzerland, Ukraine, England, Scotland, Canada, United States of America, China (which produces more than 80% of the world’s gourmet mushrooms) and Hong Kong sculptured his vision of this global US$34 billion mushroom industry. Cumulative practical experience over a 30 year period is used to educate entrepreneurs from all spheres of life, background or ethnicity. As a true initiator, he founded the first Mushroom Research Centre in South Africa. Adriaan organised and chaired the 1st Educational Gourmet and Medicinal Mushroom Conference in South Africa and was the only South African to present a paper at the 1st International Conference on Medicinal Mushrooms. He was also instrumental in the conceptualisation, establishment and management of the first mycotourism (mushroom-based tourism) concept in Africa. As invited guest speaker, he addressed international audiences i.e. the World Fungi Conference (mycotourism) and the International Mushroom Biotechnology Symposium (medicinal mushrooms). Apart from being honored with the prestigious Scientist of the Year Award, Adriaan has been involved in teaching and research into various aspects of gourmet and medicinal mushroom science, with the emphasis on cultivation technique evaluations (simple and / or state-of-the-art), indigenous substrate formulations and the development of mushroom-based nutraceuticals / dietary supplements e.g. health wines. Adriaan was appointed as honorary lecturer at the South African Gourmet Mushroom Academy® during Jan 2005 and as managing director in Apr 2007. He was selected as one of four National Finalists in the FNB Enablis Business LaunchPad Competition, an achievement which reflects a high level of entrepreneur potential and commitment. A fynbos conservation research project financially supported by the renowned World Wide Fund for Nature South Africa and executed by the Academy recently determined the role of naturally occurring mushroom species in the biological degradation of invasive wood species on commercial farms, facilitating total breakdown within a significantly reduced three year period, eliminating expensive tree chipping costs and reducing the fire hazard. From a cultivation perspective, Adriaan has proudly trained entrepreneurs from various African countries including South Africa, Botswana, Tanzania, Malawi, Zambia, Zimbabwe, Angola, Mozambique, Namibia, Swaziland, Lesotho, Malawi and Nigeria. He also recently acted as expert witness in a prominent mushroom-related court case in the High Court of South Africa. Other than his scientific and business acumen, Adriaan and his team’s mushroom endeavours and students have been featured in both international magazines such as Mushroom Business www.mushroombusiness.com and national magazines, blogs and newspaper articles. From a mushroom cultivation course perspective, a revolutionary new Mushroom Substrate Design Calculator is now available as part of a special combo (combination) deal. Together with the new Mushroom Business Design Guide with co-author Markus Peter-Erik Janssens in e-Book format, it will explain the value of the calculator with examples and substrate formulations applicable to various mushroom species. Also co-authored by Markus Peter-Erik Janssens and exceeding all sale expectations, the comprehensive international peer-reviewed e-Book titled Mushroom Cultivation Business and Marketing Secrecies comes highly recommended..